Inventory management can be a challenge for any company. Learn how to use manage inventory in QuickBooks Enterprise with Advanced Inventory to organize and streamline your business. • How much inventory do you have on hand now and ready to sell? • Where in your warehouse is the inventory you need? • How do you efficiently enter inventory data? • Which cost accounting methods do you want to use? • What is the best way to track thousands of inventory items to hundreds of thousands of inventory items? • What kind of inventory reporting do you need to make good business decisions? Advanced Inventory is included in the Platinum subscription. Requires QuickBooks Enterprise with an active QuickBooks Enterprise subscription and an Internet connection. You’ll automatically receive any new versions of our product that are released, when and if available, along with updates to your current version. 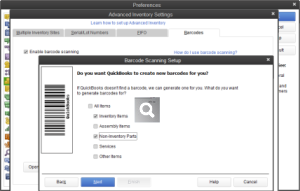 Complex inventory tasks now made easy: advanced sorting by location, bin, lot, and serial number. Among other easy-to-use tools that make managing your inventory more efficient is bin location tracking, which gives you pinpoint location information for every item in your inventory, across multiple sites or warehouses, right down to the bin. You can even see which serial/lot number is in each bin. Bin location and other tools let you sort by item, bin and location to make picking and stocking simpler and more efficient. Know at a glance what you have on hand, and where. Exactly. Everything you need to efficiently manage your inventory is integrated seamlessly into your QuickBooks, so you don’t need to worry about learning how to use yet another software package; you already know how. Your inventory data is automatically tracked as you do the things you do to conduct your business. Every invoice, every sales order, every P.O. is automatically reflected in your inventory. It couldn’t be easier – if you use QuickBooks, and you need inventory management, you need Intuit’s Advanced Inventory for QuickBooks Enterprise.